Pork Stuffed Bell Peppers In Under 30-Minutes — Welcome to Fitty Foodlicious! This is a sponsored post written by me on behalf of Smithfield® Marinated Fresh Pork. The opinions and text are all my own. Oh fall, how I love you so. The anticipation of new beginnings, everyone is going back to school, and there is a subtle change in the air. The leaves are slowly beginning to change, turning from a bright green to red and orange hues. The sun is going down quickly in the evenings, and I’ve been scheduling my evening runs earlier so that I can catch the golden, dewy sunsets. September has been a jammed packed month for us, so I want easy meals that take no time at all. That's why I love using Smithfield Marinated Fresh Pork purchased at Safeway! Be sure and check out my full recipe video below to see how I made these easy Pork Stuffed Bell Peppers. I have weddings every weekend this month, and I'm back in school full time. I bet you guys have little ones, and big kids, going back to school too! We all need an easy recipe that can be made in less than thirty minutes and tastes delicious. I love that I can depend on Smithfield® Marinated Fresh Pork from Safeway to help me create a meal in under thirty minutes that offers real flavor, real fast! The best part about Smithfield Marinated Fresh Pork is that it's super versatile to make and can be grilled, sautéed, slow cooked and even roasted! If you are getting the kiddos back to school, and don't have a ton of time on your hands in the evenings, my roasted Pork Stuffed Bell Peppers, in under thirty minutes will be the hit at the dinner table! I also use minimal ingredients, taking the thinking time out of it, making this a quick and easy recipe that can be made any night of the week! Have leftover veggies that need to be used fast? Roast them in fresh bell peppers with this delicious Smithfield Marinated Fresh Pork, and you've got the easiest fall recipe. There are several cuts and flavors of Smithfield Marinated Fresh Pork offered at Safeway, and I decided to go with the Smithfield Marinated Fresh Applewood Bacon Pork Loin Filet flavor that has no artificial ingredients of any kind and is made from 100% fresh pork. 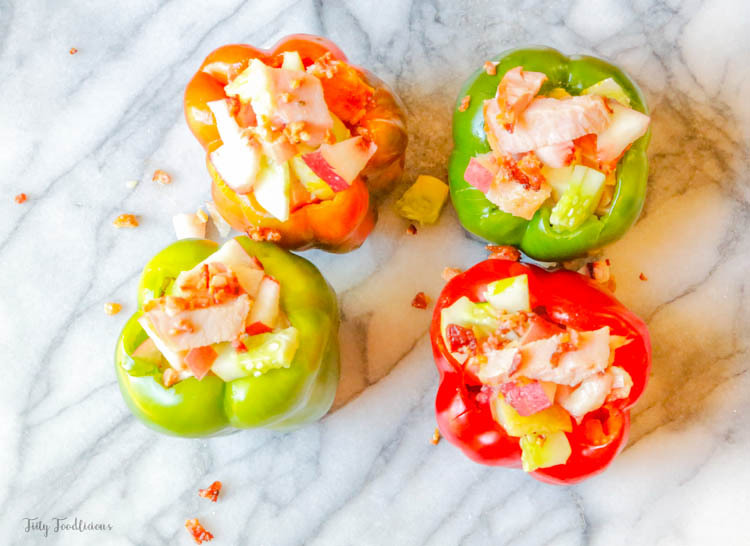 The applewood bacon gives the bell peppers a smoky taste that's perfect for fall! I crave routine and October is all about routine, routine, routine! With our incredibly busy schedules, this month, and our autumn trips on the horizon, I thrive on routine. I run in the early evenings, and I know that when I get home, I want something easy and healthy that I can whip up fast. Plus, knowing what I'm making for dinner the week ahead helps keep my routine in check and this meal has a great combination of protein and veggies that is both filling and delicious! The easiest way to make these delicious Pork Stuffed Bell Peppers with loads of veggies is to roast the Smithfield Marinated Fresh Pork first at 375-degrees for 25-minutes or until the internal temperature reaches 150-degrees. While the fresh pork is roasting, prep your veggies. First, haul out the bell peppers (I used 4, but you can use as many as you need.) The fastest way to hollow out the bell pepper is to chop off the top stem part, then core out the seeds and stem with a paring knife. Set the bell peppers aside. Next, prep the rest of your veggies. I used fresh zucchini, yellow squash, lemon cucumber, and fresh peaches for an added twist that is a refreshing addition to the applewood bacon flavor. Chop your veggies and peaches into cubes and set aside. Once the Smithfield Marinated Fresh Pork is done roasting and reaches an internal temperature of 150-degrees, set aside and let cool for a few minutes. Once the pork is slightly cooled, slice into halves and then cubes from there. Place sliced pork into bell peppers along with the fresh veggies and fresh peaches. Next, place the prepped pork stuffed bell peppers back into the oven and roast at 350-degrees until slightly crisp. That's it! Take our your port stuffed bell peppers and enjoy! With the delicious flavor from the applewood smoked bacon and the freshness of the pork, this meal is bound to be a fall staple and favorite in your household! Smithfield wants to know how you prep dinner in 30 minutes or less using Smithfield Marinated Fresh Pork and be entered to win the grand prize! For more 30-minute meal preparation ideas, and to submit your original recipe for a chance to win great prizes, head to www.SmithfieldRealFlavorRealFast.com. Want an easy fall back to school recipe that can be made in under 30 minutes and less? Check out my delicious Port Stuffed Bell Peppers made using Smithfield® Marinated Fresh Pork that delivers real flavors, real fast! Preheat oven to 370-degreesPlace Smithfield® Marinated Fresh Pork in a roasting pan and roast for 25-minutes or until it reaches an internal temperature of 150-degrees. While the pork is roasting, prep your bell peppers by chopping off the stems and hollowing them out with a paring knife. Set bell peppers aside. Remove pork from oven and let cool for a few minutes. Once the Smithfield® Marinated Fresh Pork is cooled, slice and then cube. Place the pork in the prepped bell peppers and add fresh veggies. Place bell peppers on a roasting pan and roast for 5-minutes or until the peppers are crispy. Smithfield® wants to know how you prep dinner in 30 minutes or less using Smithfield® Marinated Fresh Pork and be entered to win the grand prize! For more 30-minute meal preparation ideas, and to submit your original recipe for a chance to win great prizes, head to www.SmithfieldRealFlavorRealFast.com. Comment below and let me know what you would make with Smithfield Marinated Fresh Pork and let me know how your like the pork stuffed bell peppers!